Twenty years ago or so, a work contract took me from Kansas to San Diego for about a year, where one of my first outings was to a Moroccan restaurant in La Jolla called Marrakesh. Seb often jokes with me that my strongest memories are those that revolve around food, and this memory is no exception. I can no longer recall what specific occasion took me to that particular restaurant, but certain subtle details became forever embedded in my olfactory machinery. The ambience, the low seating and lighting, the washing of hands at the table, the belly dancers, and, most of all, the crispy, exotically rich, and oh-so-mysterious pastry full of chicken, ground almonds, cinnamon, and sugar. I remember wondering, is this supposed to be savory, or sweet? And happily concluding that it was, somehow, at the same time, inexplicably and perfectly both. Foodie friends probably know exactly what I’m talking about, as this is easily one of the world’s best dishes. But I won’t give away its secrets just yet, because for all this time I never knew (or remembered, rather) the name of this dish. The experience in many ways remained hazy and dreamlike, as if it were too good to be true, and as if trying too hard might spoil it. I must admit to searching for it at other Moroccan restaurants since then, and even coming close, but you know what they say: you never forget your first one. By the time this pastry made it home it was pretty well thawed, despite being carried in a cooler. I considered using it right away, but then probably felt overwhelmed by the pretty photos of impossibly delicate desserts on the package, and so popped it back in the freezer where it then proceeded to sit for a long time. Earlier this year and about nine months after its expiration date (who pays attention to those, anyway? ), this pastry finally got its chance, when, having recently returned from a long unplanned exodus, I found myself in a very domestic mood. Looking back, my notes from those first two months back seem unusually ambitious, and have an unmistakeable “around-the-world” thing going on. I’d brought home a new cookbook called Jerusalem, from which we sampled braised quail, falafel, shakshuka, za’atar beet butter, chermoula-roasted eggplant, and an incredible panfried fish with harissa and rose. A Latin-heavy week or two featured arepas, tostones, papaya batidos, callaloo, avocado soup, and Frida Kahlo’s corn pudding in poblano crema. Recent travels in Western Europe inspired lavender lemonade, tarte au citron with homemade preserved lemons, eggplant parmigiana, gazpacho, polenta, and homemade limoncello and aquavit. From India there was makhani dal, dosas, cachumba salad, and homemade chapatti, and from further east, bibimbap, eggplant rempeh, satay, som tam, and, for Seb’s birthday dinner, this amazing Vegan Pho. Not all of these meals were successful — for example, I remember a particularly inedible dried shrimp broth one evening, and rock-hard black bean soup another — but there’s something about the effort that I find exhilarating. To me it’s like traveling the world without leaving the comfort of my own kitchen. And here, where there’s not much choice but to cook a dinner from scratch every day, often with unfamiliar ingredients, some of which turn out to be little treasures picked up by chance, things have a tendency to get interesting. Which brings me back to this curious package of what looks like phyllo pastry, but is slightly different. 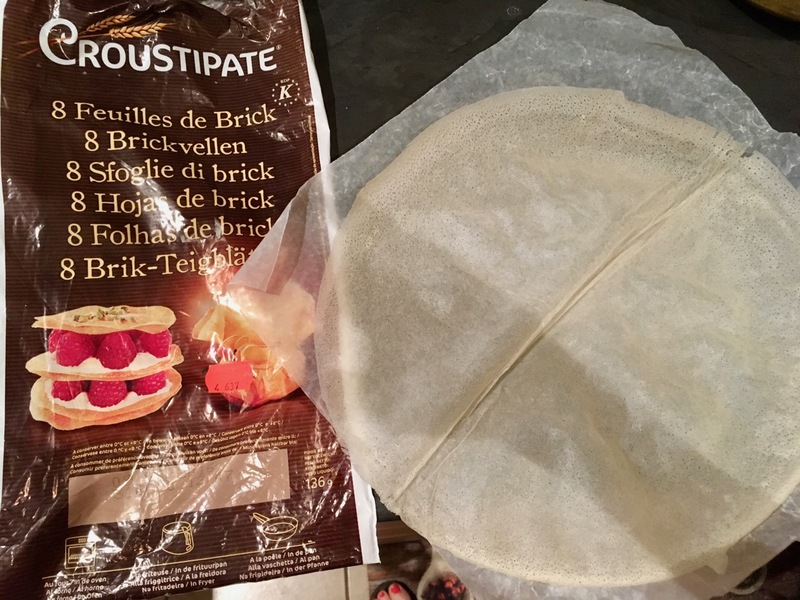 Jerusalem has a recipe called, simply, “Brick,” which they describe as a popular Tunisian street snack with the same name as the paper-thin pastry used to wrap it. Since it required a simple stuffing of only eggs and herbs, it seemed right for dinner one night when the fridge was getting a little empty. Except that it’s deep-fried, something I do my best to avoid because it stinks up the house and everything in it for, like, days. The very night I made an exception and tried this recipe, a couple of friends stopped by to say hello and drop off some books. The next day I complained to my neighbor about the oily smell of our whole house after making this “snack” for dinner, having to re-wash all the bathroom towels even, plus my embarrassment that our visitors arrived right in the middle of it, and she responded, “Aha!” with a laugh. It turns out she’d received the same visitors that night, who must have obviously just come from our house because she and her husband both wondered after they left where the overwhelming smell of grease had come from. It’s times like this when I feel a lot of respect for the common African practice of cooking in a separate building or outside. When you really think about it, it IS rather uncivilized to cook right around the corner from where you sleep! The same goes for the bathroom. I’ll never forget that part in The Poisonwood Bible when the missionary’s daughter and African husband go off to the big city of Kinshasa, where they rent an apartment for the first time, and are shocked and embarrassed to discover that the bathroom is right there, inside their apartment. How very unprivate! A funny-looking though very special dish. Shredded chicken, ground almonds, and a panoply of spices lie between those sheets of pastry. I followed this recipe, more or less, which didn’t let me down. Other versions I’d love to try include dates and orange flower water, two of my favorite things. I need more pastry, stat!! Soon we’ll have a chance to sample all kinds of versions of this dish, as last weekend we finally finished booking our Christmas destination this year to… Morocco! I’ve been wanting to go there since I was a teenager. Super excited. We’ll take one week out of the three to see Senegal for the first time, too! A school friend of Seb’s will be there visiting her in-laws, so we jumped at the chance to join her. Morocco only came about after choosing Senegal, in fact. One week in Senegal sounded sufficient (though once we get there, I’m sure we’ll wish we had more time), so we had to decide where else to spend the rest of the break. Most nearby countries that interest us require a visa in advance. Cape Verde and the Spanish Atlantic islands are so close, but aren’t well connected flight-wise between Dakar and Johannesburg. Portugal is, but is also maybe a little chilly in December. Morocco is another option on flight paths. It’s the kind of place we wanted to save for when we’d have more time, and had also hoped to see it with another of Seb’s school friends from Algeria… but I guess we shall make the best of it!! 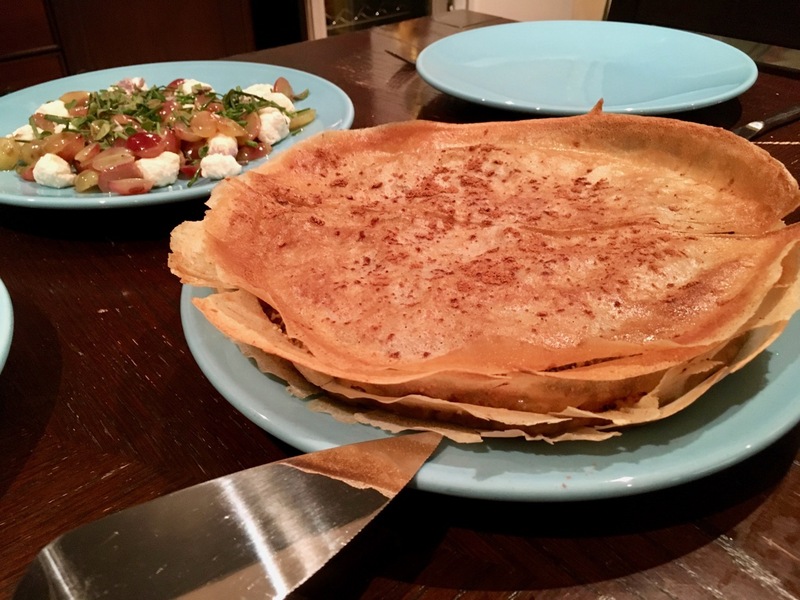 Wadih makes b’stella pretty frequently – it’s one of our favorite dishes. There’s another version that’s completely savory and made with seafood that’s pretty good as well. Glad you were able to make it!! Have fun on your trip and be sure to write about it! We live vicariously through you. I remember us eating pigeon on the boat ride in Paris with you and Ryan years ago…not a fan. But maybe it might be worth trying again if it was cooked in all of those wonderful ingredients. When you both eventually come back to live in the States (I hope! ), you must live close to us so you can cook all of these wonderful foods for us 🙂 Or, we’ll move close to you!